I Will Cling to Thee. As I sit here typing this post, I have Pandora running, as I usually do! Can you guess the song that came on just this very moment..? 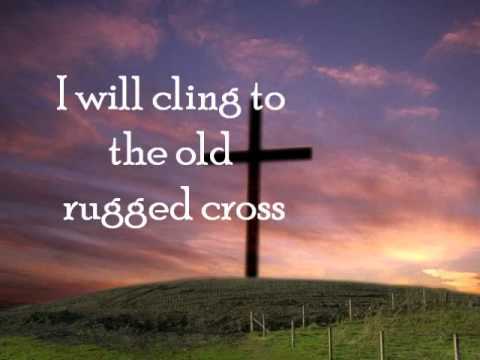 It is Old Rugged Cross by John Jones. I really do enjoy the old worship music, it really reminds me of the environment that I grew up in. It may sound strange, but it reminds me of the simplicity of who God really is. Even in today’s modern worship music, sometimes I feel that it is distracting, and takes away from who God truly is. Which leads to me to the point of this post, are you ready for it? It seems in our world today, it is so easy to forget WHO we cling to. All around us the enemy is distracting us, and trying to point us in any direction that isn’t to God and His word. Which makes perfect sense because that is what he wants, he wants to separate us from Christ, to take us on a different road, to distract us and make it seem that it is of God. We as believers have to be so careful with what we allow into our lives, our hearts are so easy to be deceived. So what do we do? We need to cling to Thee, the One who gives us His grace, love, and mercy. We need to recognize what is distracting to us. It is so easy to get wrapped up in what the world views are right and promising. Here’s the thing about the world as my husband has said repeatedly, “The world tempts you, pulls you slowly like a rope, and once you get pulled in, it chews you up and spits you out. Then you stand there broken and confused, and are not able to press on because the enemy has you so bound up. All from one little temptation.” So what do we do when we feel tempted? Cling my friends, to the One who has given us His love and grace. Press into His word(which I am convicted of that I need to be doing more). Press into His love. Press into speaking with Him, not just in a crisis. Yes, I do mean praying for those of you who are confused by that. God wants to hear our: hearts, temptations, scares, crisis, joy, sorrow, pain, suffering, rejoices, and everything about our lives. I look around me at those following the world, and they don’t have adequate peace or joy. They need some sort of God to fill them up. Whether it be: alcohol, lust, adultery, gambling, anger, food, shopping, ect. There is a lack that only our heavenly Father can bring, yet those same people reject Him. They are lost and hurting, and go to other God’s to try to fill a void only Jesus Christ can fill. So what do we do for those that don’t want to Cling to Thee? We love them. We pray that the Holy Spirit would work on their hearts. We pray that the Holy Spirit would direct our conversations to glorify Him. NO ONE is too far away from Christ to capture their heart. Nothing can keep us apart from Christ. Nothing can keep us from Clinging to Thee. He is greater than anything in this world. He is greater than any situation. Sometimes, we just need a pointer to be redirected back to what glorifies Him. Once we get that reminder, He has been there all along with his arms stretched out. What a concept. That someone loves us so much, no matter what we do or are going to do, He still loves us! I still have a hard time wrapping my mind around that! What a great example of love we have. So my friends, cling to the One who is steadfast and unwavering. Cling to Thee!